Why a Virtual Tour by Google Street View? What Efforts has TechDost already put in? This day when modernization and technology are reaching new heights every day, do you expect your customer to visit you directly with no prior outlook to your place? A big NO. To be able to see what business atmosphere is like at your workplace before ever entering it physically is what we can call modern technology. And let’s accept this, your customers do have an access to the modern technology. But do you too? They say that a picture can say a thousand words. So to lieu your customers in and to impress them, what better a way than a basic virtual tour? The power of a virtual tour will change the way others will look at your business forever. and if you don’t have yet, what are you waiting for? TechDost introduces its new venture TechDost360° for you to get your virtual tour created right now! Google Business View is an interactive virtual tour that gets published on Google Search, Google Maps, and on Google. It is actually one of the best ways to make your business stand out, drive through the traffic to your website and thus bring more people into your door! 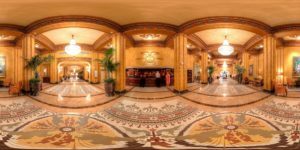 You can also Embed your virtual tour to your website or e-newsletters to add a visually-captivating experience for visitors and subscribers. TechDost is a team of Google Trusted Photographers that are trained to make businesses shine online through the Google Business View experience. TechDost 360o is one of the few companies certified by Google Street View so far. We have uploaded around 100 photos till date and we got 1.1+M views on the photos thus enlarging the businesses of our clients to a wider extent. Our photographs are highly up-rated and have been immensely helpful to our client companies to showcase their business and their perspective about the world. Currently, Techdost 360o View team consists of two eminent Google trusted photographers- Akshit Chaudhary and Shani Deshwal. We are using latest and high recommended cameras and accessories by Google. You can check out our 360o Cameras and Accessories here. Due to privacy, We can’t share our business client’s tours and analytics/insights with other clients. So, here are some other demo pictures which describe how these virtual tours are helping visitors/Customers to find the best shop/office from anywhere.